I have been reading all these blogs that have been answering 20 questions about themselves. I don't know about you but I love stuff like this. I love to know about "other people". I love when bloggers do "a day in the life post" too. I have always wanted to do one but I think I have such a boring life and I don't think my "day in the life" post would be very fun to read... but you know what other bloggers probably think that about themselves too? So maybe I will do one soon? I also love when bloggers tell me how they do "things"?? One of my favs is when bloggers tell what make up they wear. I always find some drug store find every time I read those that I love. Whether it is a new type of mascara or a new lip gloss etc. It's so fun to me?? What about you do you like those post??? OK so I am going to answer 20 questions about myself...here we go!!! 1. What is your road trip essential snack? Diet Dr. Pepper would be my drink... although I gave up diet drinks for lint and have actually kept it going with an exception of one every once in a while. As far as snacks...i love candy... twizzlers, mini chewy sweat tart balls, hot tamales... for snacks i love chezzits and trailmix too... i could live off snacks alone! 2. You've been handed two free round-trip tickets...who are you taking and where are you going? I could wake up to this in the morning what about you??? 3. What was your high school jam? 4. Would you rather have a perfect bum, or a flawless face? 5. What shows are you ashamed to admit are on your DVR? I don't know that I am ashamed of any of them but I am a reality TV watcher... bachelor, dwts, duck dynasty but I do miss Desperate Housewives... that was our sunday night show! I actually had to go look in my settings on my phone b.c i had no idea... Strum is my ringtone for everyone else except RP and he is sonar... don't ask me why??? that is how the dude at the phone store set it up and i have never changed it???. 7. How old were you when you had your first kiss? Was it meh or toe-curling? I was 14 years old... freshman in highschool is that how old you are??? I am sure it was meh ha! we were kids! 8. Do you have any siblings, and if so, where are you in the birth order? 9. What physical quirk were you born with? Does being able to curl my tongue count? IDK??? 10. What was your first car, and did you name it? 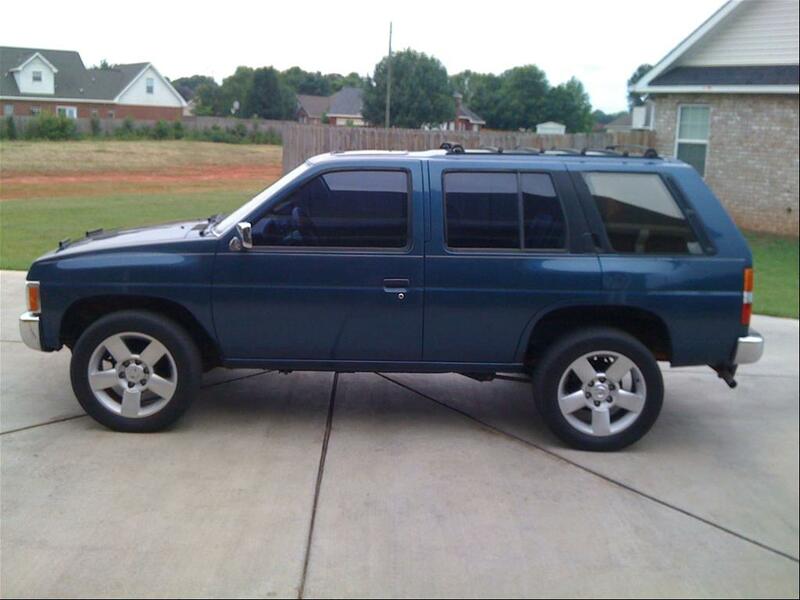 Nissan Pathfinder... Blue... why did i pick that color... no name... could have been smurf??? 11. What would you request for your last supper? 12. Have you ever been hospitalized, and if so, what for?! Just when I had my babies... so yes twice! 13. How tall are you? Do you wish you were taller, shorter...or are you just right? 14. Do you prefer to DIY or hire it out? I love doing DIY but sometimes those projects don't always get finished... so if i want it done i would hire it out... which means call my dad and get him to come do it! :) No knock on RP... fixing things is just not his strong point... its ok i still love him! 15. What do you eat for breakfast? I am not a huge early morning breakfast person... I don't eat anything until around 9am. Sometimes I will get a biscuit or CFA chicken minis but... most of the time it is a granola bar. 16. What would you do for a living if you didn't need money? I would be a personal shopper... especially for baby/toddler clothes so i could dress all their little chunky legs in smocked bubbles forever! 18. How frequently do you wash your hair? Do you have any hair secrets or tricks? 19. Will you leave the house without makeup? yes... as a matter of fact i leave the house everyday without makeup... my make up stays in my car and i put it on at the 3 red lights from my house to work... or in the parking lot at work if i make all the light but that rarely happens... and sometimes I just go without... its all good! I have also been know to wear powder, blush, lip gloss & sunglasses! :) . 20. You just unloaded your Halloween haul...what candy do you go for first? Reese cups,.... my kids will go trick or treating and if they get a Reese cup they will go ahead and give it to me right out of their bucket on the street... they love me... i like snickers too! That was fun!! What about you??? Join in on the fun!!!! Are you surprised about anything?? ?